The Venue Allocation competition type should be selected when matches for one or more competitions need to be allocated to specific times on specific courts or at certain venues and these allocations then remain in place throughout the entire season. This format is commonly used by team based sports such as basketball and indoor sporting complex competitions such as Futsal. 1. To create a new competition, hover over the Competitions and click List Competitions. 2. Click on the Add a Competition icon in the top right hand corner. 3. You will then get prompted to select whether you would like to create a Home and Away competition or a Venue Allocation competition. There is a brief explanation of each of these next to the buttons to proceed. Select to create a Venue Allocation competition. 4. All the fields that are marked with a red star are compulsory and need to be completed before being able to navigate away from this screen. Competition Names should be as specific as possible so as to remove any confusion when allocation teams or members to the competition. Competitions should also be assigned to the same season as what the current season is otherwise they won't appear on the website and members and teams can't be assigned to it. Note: The very important field(s) for the Venue Allocation set-up is the Day(s) Competition Run'. At least one of these days need to be ticked for the matches in the competition to be allocated to start times at your venues. You will also notice that it is not compulsory to assign a Default Start Time for Court Allocation competitions. This is because start times will be manually assigned when you allocate matches to courts. Once the fields have been filled in correctly then click on Update Competition and the competition will be created with the parameters set as per the fields. When this has been done in the Court Allocation set-up screen you will notice that the new Support Guide will appear in the right-hand side of the system. This support guide displays the steps that are involved in completing the creation of a Venue Allocation competition so that it is ready to publish onto your website. The bold step signifies the next step you need to complete before you can move forward in the process. You can click on any of the steps to jump to the corresponding screen. As you can see above Venue Start Times still need to be set up in this database. This will be explained below. To create Venue Start times click on the Create Venue Start Times link in the guide. This will take you to the to the Venues screen which will list all the venues you currently have set-up in the database. Alternately you can get to this screen by clicking the Configuration (spanner) icon and selection the Venues option in the menu. 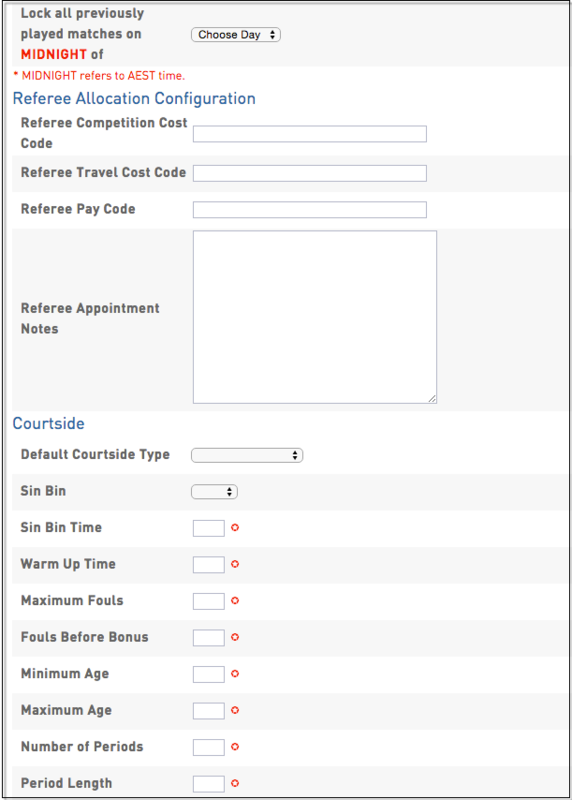 To add a Start Time to a particular venue or court click on the View button next to the appropriate court or venue. You will go to the Manage Venue Start Times screen for that particular venue. This screen will list all of the start times already set-up for the venue. As you can see in the above example no times have been set-up for this venue yet. At this screen you can add a up to five start times in one go. To do this select the day of the week from the drop-down box and a time. Once you are happy with the times that you have chosen click the Add New Start Times button to create these. The screen will refresh and the start times will now appear listed at the top of the screen. Any of these can be deleted by simply clicking the trash can icon next to the start time you wish to remove. You can continue adding these these until you are happy that all the start times necessary have been assigned. To return to the Venue Screen to assign start times to other venues click on the Create Venue Start Times link in the Support Guide menu. You also have the ability to copy venue start times to one venue from another. To find out how to copy venue start times please scroll down. If you do not need to create any further venue start times you then need to decide whether new teams need to be created for competition you are creating or if the teams are already created and simply need to be assigned to the competition. If they need to be created click the Create Teams link in the Support Guide. This will take you to the list of teams in the database so that you can add new ones in. Click here to jump to that support section for adding teams If the teams already exist and you simply need to assign them to this competition click on the Add Teams to the Competition link in the support guide. This will take you to Assign teams to competition screen. Click here to jump to how to assign teams to the competition Copying Venue Start Times Copying venue start times can save valuable time if you have multiple venues or courts that will need to have matches starting at the same time. Form the venue screen click View next to the venue that you want to copy the start times into. At the Manager Venue Start Times screen scroll down to the bottom of the page. You will see the Copy Start Times section. Simply select the venue you would like to copy start times from the drop-down box (in this example I have select AAMI Park which is the example used in the Creating Venue Start Times section) and then click the Copy Start Times button. The new start times will appear assigned to the venue. You can copy as many venue times slots as you would like to venues. 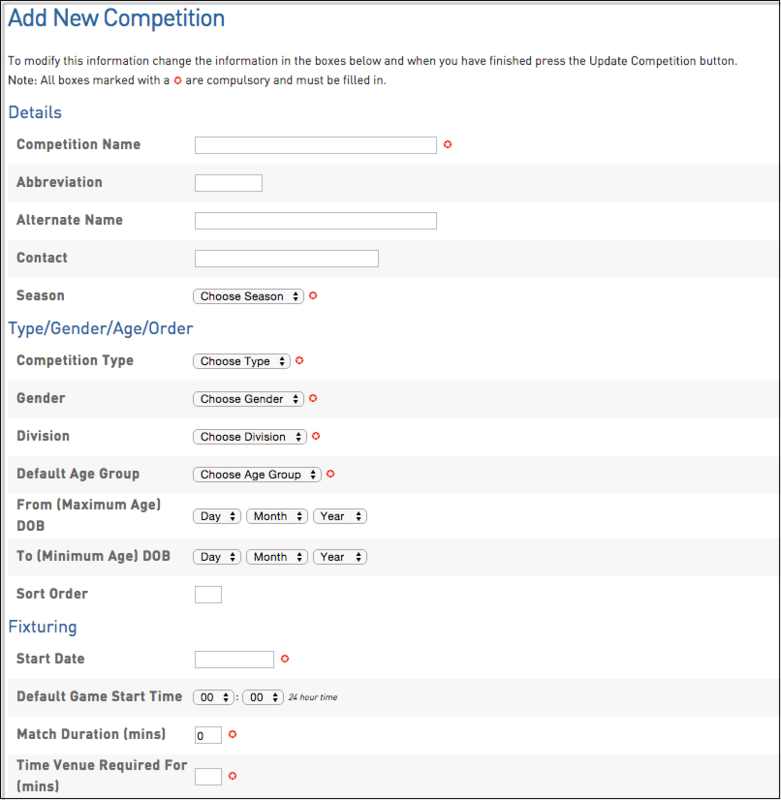 Once all you start times have been set-up you now need to decide whether new teams need to be created for competition you are building or if the teams are already exist in the database and simply need to be assigned to the competition. If they need to be created click the Create Teams link in the Support Guide. This will take you to the list of teams in the database so that you can add new ones in. Click here to jump to the support section for how to add teams to a competition If the teams already exist and you simply need to assign them to this competition click on the Add Teams to the Competition link in the support guide. This will take you to Assign teams to competition screen. To assign teams to the competition you are creating click on the Add Teams to the Competition link in the support guide. This will then take you to the Team Selection screen. To pick a team, you first need to select the club from the left hand drop down box and then the list of teams available to be selected will appear in the right hand column. If the team that you are after isn't displaying you may need to change the Unassigned Filter to All Teams as the team is more than likely in another competition already. Highlight the team you want to add to the competition then click the arrow facing right to move it into the Selected Teams box. To remove a team from the competition simply highlight the team in the Selected Teams box and click the arrow facing left to remove the team. Once all of the teams that you require are in the right hand side window then click on the Update button and these teams will now be assigned to the competition and ready for fixturing. You are now ready to allocate the matches start times click on the Create Venue Time Allocations link in the support guide. Creating Venue Time Allocations is explained below. Create Venue Time Allocations Once you have clicked on the Create Venue Time Allocations link in the support guide you will be taken to the Venue Time Allocation screen. Here you need to select the Season that the competition you need to create venue allocation for is in from the first drop down box and then you need to select the Day of the Week the competition plays matches. If the competition plays matches on multiples days simply select the first day of these. In the example competition the season the competition has been created in was 2010 and the day of the week matches are going to be played on are Saturday. Once these selections have been made click View Allocation Grid to continue. The Venue Allocation Grid will appear for the day you have selected. Now it is simply a matter of dragging and dropping matches on the Start Times for the given venues. As you can see in the above example the competition that has been created for the support information seen here is the Test Support Competition and the matches for these are labelled the Test Support Competition Match 1,2,3 and 4. The number of matches has been decided in the competition set-up. 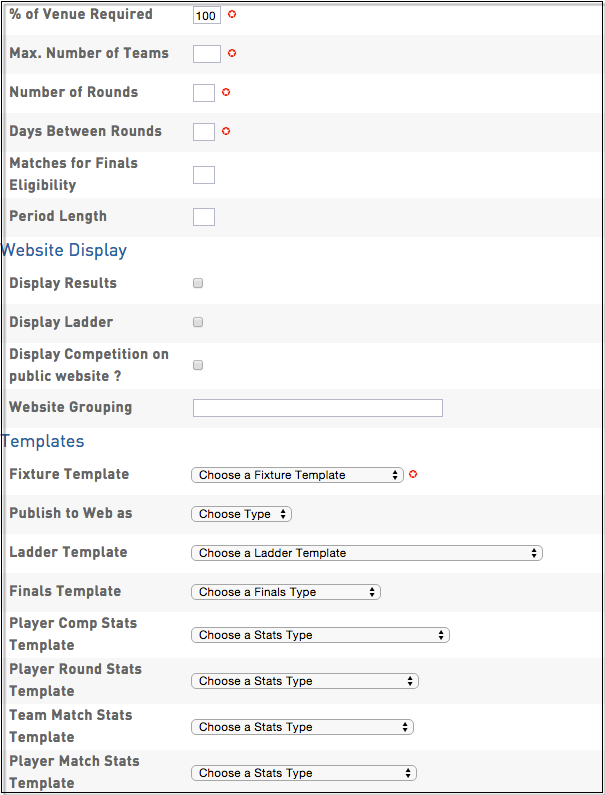 Because the competition is an 8 team competition using an 8 team fixture template the system knows 4 matches will need to be scheduled per round. Drag and drop the matches onto the start time you would like. Continue to do this until all the matches for the competition have been allocated start times. You will know this has been done successfully because there will be no matches left in the Unallocated match box on the left-hand side. Note: It important to remember that the changes made save automatically, you do not need to click anything to save these. If you needed to allocate matches start times from other days you can jump straight to the day by clicking the day name link at the top of the screen. Once you have allocated all the start times for as many competitions as you would like to you are ready to generate your fixtures. Click on the Generate the Fixture link in the support guide. 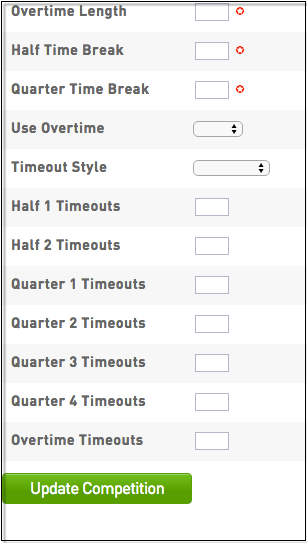 This will take you to the Bulk Fixture Generation screen. Generating the fixture(s) is explained below. Once you are ready to generate the fixture(s) for the competition click on the click on the Generate the Fixture link in the support guide. This will take you to the Bulk Fixture Generation screen. 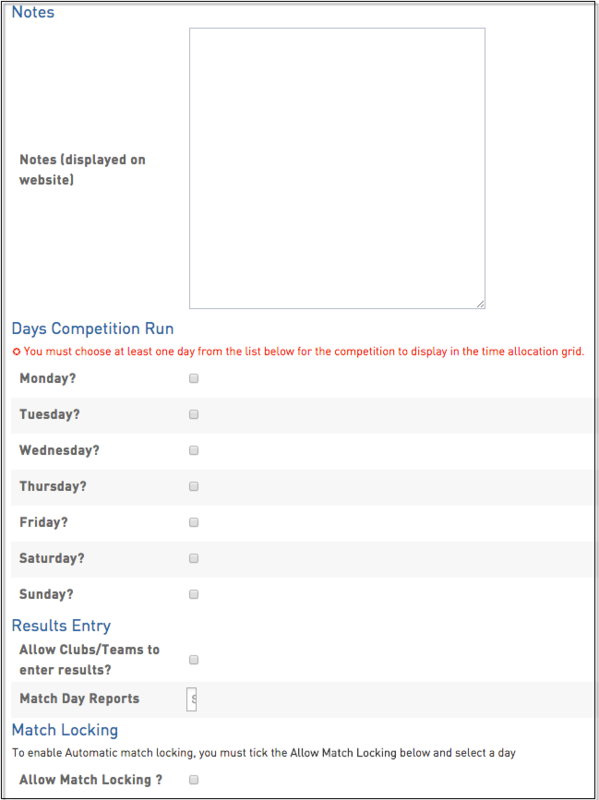 Select the season that the competitions you want to generate fixtures are within and click Continue. 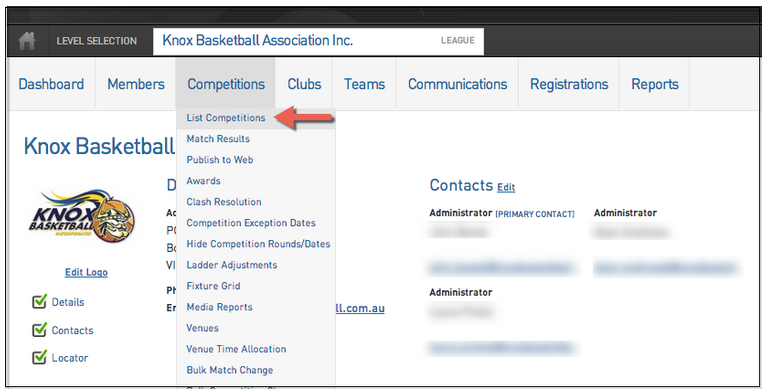 You can now tick the boxes next to the competition that you wish to generate the fixtures for. Once you have ticked all the relevant boxes click the Generate Fixtures button. The fixtures will be created for all the competitions selected. You can view the the fixtures for these competitions by clicking the link for the appropriate competition.